A week removed from an on-track handicapping tournament where five of the top 10 finishers were not members of the NHC Tour, I maintain that it is patently unfair to dues-paying NHC Tour players to lose out on any opportunity to accrue valuable points in the NHC Tour standings. Call me a whiner if you will, but I can take the criticism, and you'll see my side very quickly. The general public might first question...what is an NHC Tour, and what standings? The short answer is that anyone interested in thoroughbred racing and, handicapping contests (i.e., players compete against each other to see who can accrue the biggest bankroll on a particular set of races) in particular, pays an annual membership ($50 in 2012, $45 in 2011) to join the Tour. Members have access to a handful of "free" online tournaments, plus other swag (i.e. Daily Racing Form discounts, political advocacy). The brass ring for NHC Tour players, however, as evidenced by the Tour's headline bullet point about membership, is winning 1 of 500 berths in the National Handicapping Championship (NHC) each January in Las Vegas. The 2013 prize pool is a not-to-shabby $1.5 million and has fringe benefits, including a championship ring and getting your face plastered all over the DRF. For the 2012 season, the Tour cognoscenti -- presumably with input from its annual member survey -- added new wrinkles for qualifying for NHC XIV, namely greater emphasis on contest participation (especially on-track) and accruing Tour points for finishing in the top 10% of on-track or online contests. The Top 100 point-getters (an all-time high) get a spot in Vegas, whether or not they've won a qualifying tournament, so clearly Tour points matter. The premise to give players who play regularly a greater shot at qualifying for Vegas even if they fail to outright win tournaments makes sense, especially when trying to grow interest in not only the contest circuit and its organizers (i.e., racetracks, online venues such as HorseTourneys.com and NHCQualify.com), but a languishing thoroughbred racing industry in general. Until last week, when with a few races left in the Suffolk Downs contest I was in seventh-place out of 135 players, I had not given Tour points standings much thought, considering I am not a full-time handicapper and lack the bankroll to play in enough contests for points to probably matter, and my handicapping has been weak when actually having the time to play (generally at Monmouth Park or online). However, the outcome at Suffolk ruffled my feathers, with the blame squarely on the NHC Tour. Similar to contests at nearby Monmouth Park, Suffolk Downs (to no fault of its own) allowed players from outside the NHC Tour to enter. As noted last week, caveat emptor -- I knew going in that anyone from off the street could plunk down $60 to play. I have no problem with this setup, recognizing the value of maximizing player participation and letting first-timers kick the tires of a contest, so to speak. As fate would have it, 5 of the top 10 finishers were not members of the Tour. My problem with this is strictly from a Tour points perspective. 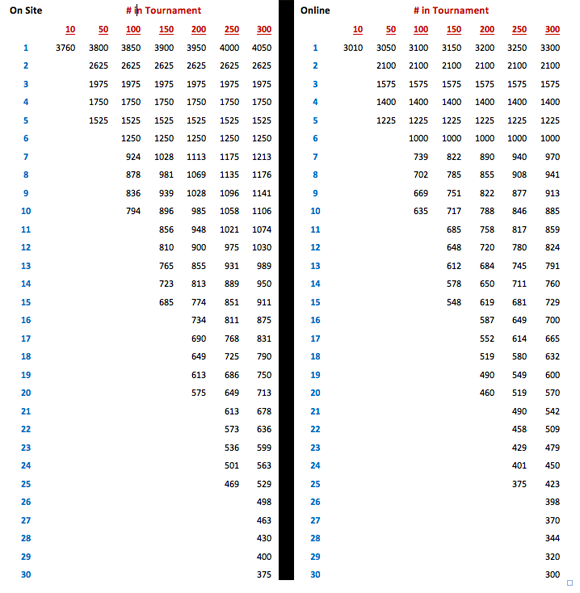 A glance at the Tour's Points by Event chart shows the top NHC Tour finisher, Tony Linares, collecting 2,625 points, which based on the chart above suggests he finished second to a non-Tour player in an event with 100-149 players. Granted, Tony and fellow Tour members Pierre Poulin (1,750 points) and Joe Long (1,525 points) won automatic berths to NHC XIV as the top three Tour finishers, but only two other Tour players (Henry Conte, 941, and William Clark, 816) scored Tour points. This suggests that, NJ Horseplayer, as the 15th-place finisher overall (and, at worst, 10th among Tour finishers) got zero points. In essence, the non-Tour players who finished ahead of me and any Tour players who finished 11th-14th cost us points in the standings. 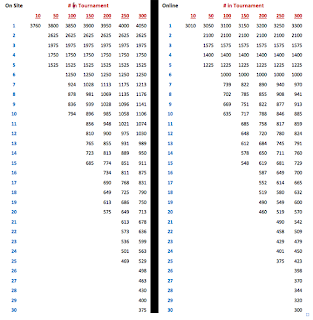 OK, the 800-1,200 Tour points we could have gotten may appear negligible, but as I see it there are probably only a select group of Tour members who have already qualified for Vegas who will continue to play in tournaments throughout the year to accrue points (i.e. full-time/professional handicappers). Indeed, the Tour paid out $50,000 to the Top 10 point-getters for the first half of 2012, including $15,000 to top finisher Rhonda Sylvester. Clearly, there is concrete monetary value to these Tour points. On the other hand, you might have NHC Tour members who qualified for NHC XIV in Vegas who no longer see the need to play in NHC-focused handicapping tournaments to accrue Tour points. Then, there are Tour players who have yet to qualify for Vegas by virtue of a qualifying tournament victory but are in the Top 100 of the Tour points standings, such as my friend Terry Flanagan of Red Rock or Bust, who through August 8 was 99th in points -- striking distance for an NHC XIV berth. Say Terry was in my shoes at Suffolk -- Top 10 among NHC Tour members, but zero Tour points for the effort. In that case, 800-1,200 Tour points would have proven extremely valuable to his cause to make it to Vegas and put him somewhere among the Top 40-60 point-getters. Instead, 5 folks with zero interest in the NHC Tour or unwilling to pay $50 last Saturday to join the Tour took points away from Tour members. This is an extremely mixed message for Tour players and devalues the $50 membership. In my case, I could have taken care of business by handicapping slightly better last Saturday and beating the NHC Tour players above me. I also get that the host tracks want to maximize participation in handicapping contests. However, I would task the NHC Tour with addressing an obvious loss to Tour members. I would argue that this would even give Tour players the motivation to hang around contests longer, since a 19th-place finish would have Tour-point value; now, such a player might take a late-contest stab on an unplayable long-shot in hoping for a miracle win and Top 10 finish. There should be no mechanical hurdles to enacting such changes. To ignore implementing or even considering such a methodology would remove the exclusivity or luster of belonging to the NHC Tour. Feel free to share our thoughts in the comments section below. Trust me, when I win NHC, I can't wait to shove that big gold championship right in your face, LOL! Excellent point...makes a lot of sense to me and should not be that complicated to enforce.